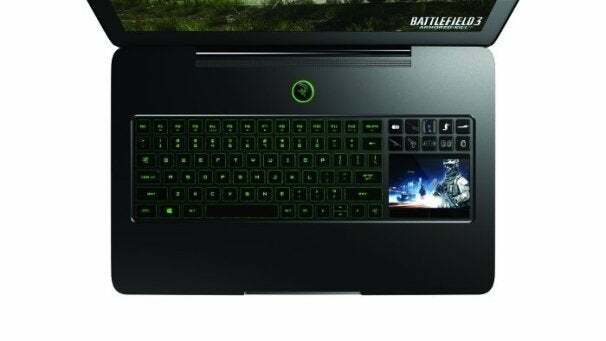 Gaming hardware maker Razer recently announced a refresh to its Blade gaming laptop, a high-priced, yet unique gaming system that debuted in 2011. Razer's goal with the Blade line is to offer a powerful notebook with an attractive design that is as portable as possible. Last year's model was certainly a beauty, and the second iteration of the Blade looks to be pretty much the same on the outside. But the good news is the specs have been bumped up a bit while the price has come down by $300 from $2800 (original price) to $2500 (new model). The new Blade is available for pre-order now and starts shipping in North America on September 30. It's not clear why, but the new Razer Blade features an as yet unnamed quad-core Intel Ivy Bridge Core i7 processor. A quick search on Intel shows the chip maker offers 13 quad-core Core i7 chips that range in clock speed from 2.1GHz to 3.5GHz, in addition to the 3.8GHz Core i7-3920XM Extreme Processor. The original Blade has a dual-core 2.8Ghz Intel Sandy Bridge Core i7-2640M. Graphics for the refreshed Blade include the NVIDIA GeForce GTX660M GPU with 2GB GDDR5. The main display stays the same at 17.3 inches with 1920-by-1080 resolution. The device refresh also features the unique touchpad from the original that can double as a secondary LCD display for waypoint maps and other data when you have a peripheral mouse plugged into the notebook. The new Blade features a hybrid storage set-up with a 500GB hard drive and 64GB solid state drive. Other specs include three USB 3.0 ports, HDMI out, 8GB 1600 MHz DDR3 RAM, Gigabit Ethernet port, 802.11 a/g/n Wi-Fi and Bluetooth 4.0 connectivity. Razer also says the new Blade has a redesigned thermal system to get the heat out of the device more quickly--an essential feature for any system with such graphics-intensive components. The company says the new Blade has larger vents and specially designed heat pipes that allow for more airflow to the laptop's temperature-rising guts. The new Blade comes with 64-bit Windows 7 Home Premium and lacks an optical drive just like the original. Similar to the original, the new Blade is somewhat thinner and lighter than traditional gaming laptops with a depth of 0.88 inches and a weight of 6.6 pounds. Compare that to the MSI GT70 desktop replacement/gaming laptop released earlier this year that tips the scales around 8.4 pounds and is more than 2 inches thick. The MSI GT70 has double the RAM than the new Blade as well as an extra 300GB of storage and a Blu-ray disc player--a big contributor to a laptop's thickness. The GT70, however, is also $500 cheaper with an MSRP around $2,000. Other desktop-replacement notebooks are also significantly cheaper than the Blade. As with the original, you won't save any money with the new Blade, but if you plan on toting your gaming system around town, the new Blade will be a lot easier on your back than most gaming notebooks. Razer is also selling the original Blade for $2300. It's not clear if the company plans to continue selling the older model indefinitely or for a limited time.